The last Bank Holiday of the summer and the weather looks to be a little unpredictable for the work I have ahead. Among the flying jobs between Thanet and the Isle of Wight, I have two marriage proposals, one wedding and happily no funerals! If this blustery wind persists overnight, then two nervous suitors with big plans are going to be very disappointed and I'm doing my best to manage their expectations in view of the weather forecast. I've always had an unfortunate tendency to pick interests which are weather dependent. 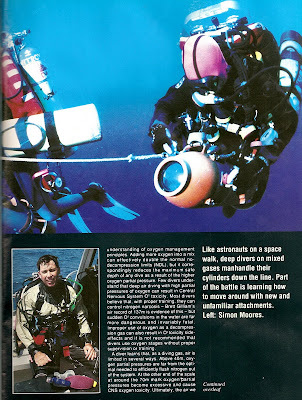 in the early 1990's I ran Submariner Consulting Ltd and had an interesting time contributing to the development of the early industry surrounding mixed-gas deep diving; writing extensively for several specialist publications such as aquaCorps. The picture on the left was taken on a dive on the cruiser Wilkes-Barre, which lies off the Florida Keys in over 250 feet of water and some other equally interesting adventures included visiting Comex in Marseilles for their 800 metre record, exploring central Florida's 40 Fathom Grotto on air in the years before new technology made it more accessible, and introducing Trimix procedures to the Israelis, 100 metres down off Eilat. When I was a much younger I used to test my kit at high tide off St Mildred's Bay but one day, between it and West Bay, I was hooked by an excited angler from the promenade, so never tried that again! The sad thing about the days, pre-circa 1995, is how so much useful information is now buried in boxes or archives and will never find it's way on to the internet. Cosquer Cave for example that I once wrote about, a fascinating prehistoric mystery, a cave which is now only accessible from a narrow entrance under the sea near Marseilles and which has wall paintings and carvings dating back to Upper Paleolithic. The internet is a wonderful thing but sometimes we forget there was a time and a world that existed before it!